Most people can see the obvious correlation here, except Dr Svalgaard, who needs to wipe his windows! It is interesting that Hung uses a relatively simple technique involving conjunction and opposition. 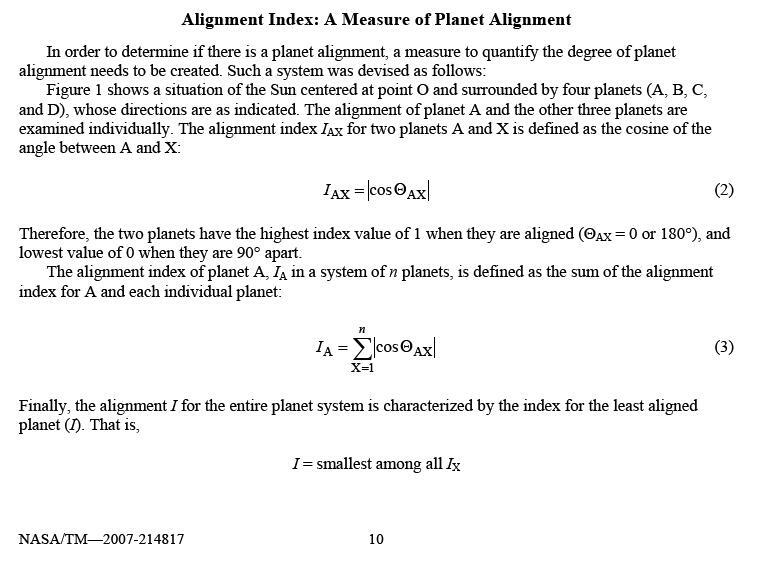 Another part of his paper devoted to the incidence of solar flares compared to the position of planets notes that there is a good correlation when the planet is around 30 degrees from the location of the flare, as well as when it is directly overhead. Traditionally astrologers count 30 degree aspects among the ‘harmonious aspects’ along with 60 degree and 120 degree ‘triangular’ aspects. This reminds us of Charvatova’s ‘harmonious’ and dis-harmonious periods of the sun’s motion about the barycentre; solar activity is high when the trefoils are regular and it’s ‘petals’ are spaced around 120 degrees apart, as in the epochs along the top row of the diagrams below. 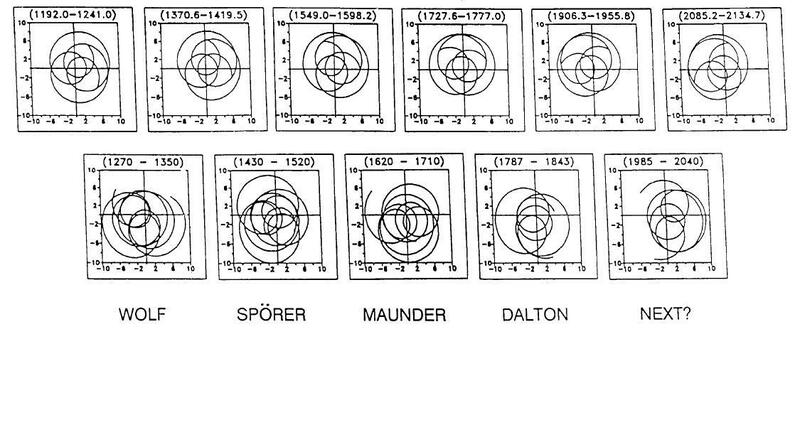 The bottom row shows the sun’s dis-harmonious motion during the periods when solar activity was very low. Desmoulins graph shows the alignments running out of phase prior to the Dalton Minimum around 1800-1820 (when Neptune and Uranus were coming to conjunction). 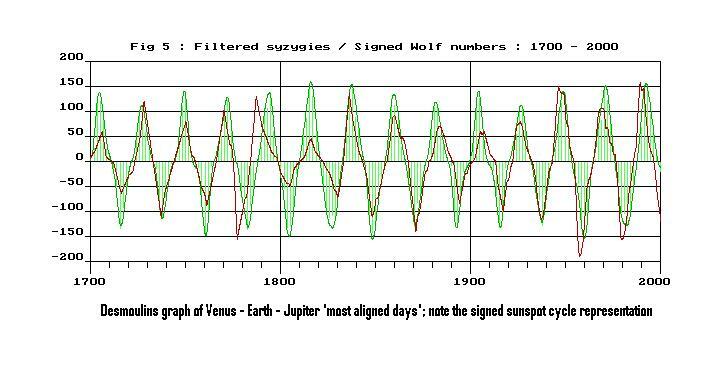 It seems to tie up more neatly with the solar cycles and I wonder which aspects or angles Desmoulins used. It should be noted that in traditional astrology, the angles are relative to Earth, and are not heliocentric. It may be an interesting exercise to run some tables with harmonious aspects as seen from Jupiter, Earth and Venus as well as from the centre of the system. This might help determine whether the effect is electromagnetic or tidal. ” weather” activity on the sun must be heliocentric and modified by other system bodies forces. Kind of like struring a pot and causing mixing of the stratifications, and the pot is suspended so it moves from side to side. The font is a bit small I agree. 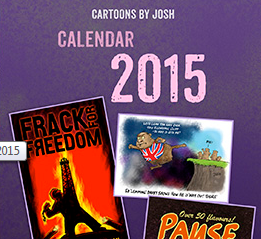 I’ll have a look at some other themes. I agree the solar weather happens on the sun, kinda tautological really. What I was getting at was that we may get further with the question of how much of the planetary effects on the sun are tidal/gravitational and how much they are electromagnetic by testing the strength of the correlations from different places. Tallbloke; I’ve been thinking about your above remark on gravitation vers. EMF effects of system bodies. The earth / moon pair is unique in the fact that the earth is more EMF active for its’ mass as half of its’ original crust was striped off in the formation of the moon. The rotation of the moon around the earth and its’ distance from the earths’ surface as well as their distance from the sun should show up during eclipes as the moon blocks EMF effects and increases gravitation effects on the sun or other bodies. The moon may or may not block EMF effects from elsewhere. Magnetic fields don’t just work in straight lines. It does block straight line radiation though. It’s gravitational effect on th Earth is smaller than the sun’s but varies a lot more in terms of it’s action as it’s declination changes and as it orbits. And of course, it’s proximity causes bigger tides than any other body. For orbs smaller than 15°. Orb is the angle at the closest encounter of the three planets Ve-Ea-Ju. I add a sign to this angle to respect the “Bracewell” convention for alternate signed sunspot numbers. It turns out that this sign is also linked to the situation of Earth – Venus during the triple syzygie : either in opposition or in conjunction. thanks for visiting my blog, you are recognized here as one of the early pioneers. Did you use only the heliocentric conjunctions and oppositions in your study? Yes, only heliocentric. I never tried with geocentric coordinates (for me, no physical meaning). I did not use SSB centered coordinates : could give also good results. Thanks Jean-Pierre. Do you think there might be any value in looking at 120 degree and 60 degree heliocentric configurations? The ruling factor, in Holocene temperature change, and variation of the solar cycle, is the Earth/Venus relationship with the 4 gas giants. Typically, the strongest -ve or +ve changes occur when the Superiors are in hard lines and/or squares, and the Earth/Venus syzygies are also in line or square to them. Given a configuration of Saturn and Jupiter, opposite Uranus, square to Neptune, an E/V conjuction in square to S/J*U, gives low solar activity, and produced the coldest N.H. winters of the last 2000yrs. If the E/V conjunction is in line with S/J*U, this will increase solar actiity, and a positive temperature feature will result. This principle of a change in sign of the solar output due to a 90 deg. displacement of the E/V syzygies, applies with any Jovian configuration, and these relationships, clearly show what is behind MWP, LIA, and many individual cold winters. Nextly, most curiously, a E/V conjuncion, compared to an E/V opposition, also shows a 90 deg. displacement relative to the Jovians, such that S/J*U square to E/V conjunction = S/J*U in line with E/V opposition. This, and the fact that the Sun is highly sensetive to dwarf planet Ceres, when it is in fairly good syzygy or stellium with one or more inner planets, has completely centered my attention, to electromagnetic mechanisms. Rog, I would more concerned with `bisctors` of a pair of boies in relation to others, in lines and square particularly, rather than 120 deg. configurations, I agree with Nelson on this. Some squares are maximum values, such as Jupiter opposite Saturn and Uranus, with an E/V conjunct, square to them, July 1852, Feb 1894. Saturn opposite Jupiter and Uranus has the E/V conjunct in line for the maximum value, E/V square to them on this config` would be very minimum. A nice tight line of Neptune opposite Jupiter and Saturn also has its maximum value with the E/V conjunct square to them, the inverse of Saturn and Jupiter opposite Uranus. Hi Jean-Pierre, I am looking forward to seeing an update to your graph, interested to see if cycle 24 brings both cycles back into sync. Dont mind the new theme Rog, very fancy. Hi Geoff, nice to see you posting on WUWT again. And to see Leif posting some considered responses to you. Progress of a kind. Where can I get a copy of the 10Be data to play with? There are squares between Earth/Venus syzygies, and Jupiter, at every sunspot cycle maximum. In C23 max., it was the E/V conjunctions that were square to J. As to whether this type of square is +ve or -ve, depends on where the other Superiors are. What really interests me is the alternating E/V oppositions and conjunctions lining up with J in each cycle. in relation to the magnetic reversal of the Sun`s dipole at each maximum, it rather smacks of something electromagnetic going on. I don`t see how this can be explained by tidal effects. interesting observation, and I think you’re wise to continue this here, rather than on WUWT for now. I for one agree that a electromagnetic cause is more likely. After all, the sunspots are themselves electromagnetic phenomena. The Nelson presentation text you linked on WUWT was extremely interesting, and I’d like to hear more about the points you agree and disagree with her on. Interesting article there Ulric. Am I right in saying the Magnetic North Pole is currently on an excursion? it sure is. Have a look at on old article on this blog, and at Vukevic’s stuff. It’s worth Googling WUWT for Vuk’s posts for more recent graphs he hasn’t linked yet. Hi Rog, the WUWT postings began by mistake but what the heck. I have also been after Steinhilbers 10Be data but he was not forthcoming. My comparison of his data and Solanki’s 14C was graphical, but if you are after Solanki’s data I can give a link. Looking forward to Jean-Pierre’s update. Geoff, yes please! Have you seen my new post??!! Jen-Pierre, I also look forward to your updates. Please let us know when they are ready, I would like to feature your work on a seperate thread here if you are willing. The link to the new paper is not working Rog. Thanks for the 14C link Geoff, de Jager link fixed. Leybourne, B.A; & Adams, M.B. Nino tectonic modulation in the Pacific Basin. Whilst your alignment of sunspots and alignment eyeballs well there are some oddities that need explaining. Gravity acts at the speed of light (does it?) and hence the sun should react to alignment instantly or with some fixed delay but sometimes it is simultabeous and sometimes delayed. Why? The killer is of course that some times the sunspots PREDICT the allignment 1980 -2000. What would be the explanation for this? Can it be applied to lottery results? The Sun generates it’s own quasi cyclic rhythm with it’s dynamo action affecting the interaction with the planetary cycles. Being an extremely massive object relative to the other objects in the solar system composed of highly mobile and highly magnetically active material, the sun resonates at many frequencies. This internal rhythm likely forms beat cycles with the planetary cycles. Thanks for your playful question, I hope you might join in with a bit of ‘out of the box’ thinking and contribute further. The “sunspot cycle” is a proxy of something really complex happening inside the sun. Mainly MHD system inside the “convection zone”, the more significant being the magnetic field transport which drives the “hale cycle”. I think now that the planetary alignments, or peaks on the tidal functions, act at many levels : on the convection zone, on the radiative zone, perhaps in the thin layer called “tachocline”. They act as correction terms in the differential equations which, once integrated on the long time, succeed in synchronizing the overall dynamical process and modulate it’s phase and amplitude. It acts locally and has global consequences. Thanks Jean Pierre, I was just modifying my reply to TFP as you were responding. I agree with you that it is likely there are gravitational and tidal effects in addition to the electromagnetic effects. As you say, sunspots are the surface manifestation of deeper activities. For alignment to be the driving force it must precede or be coincident with sunspots. 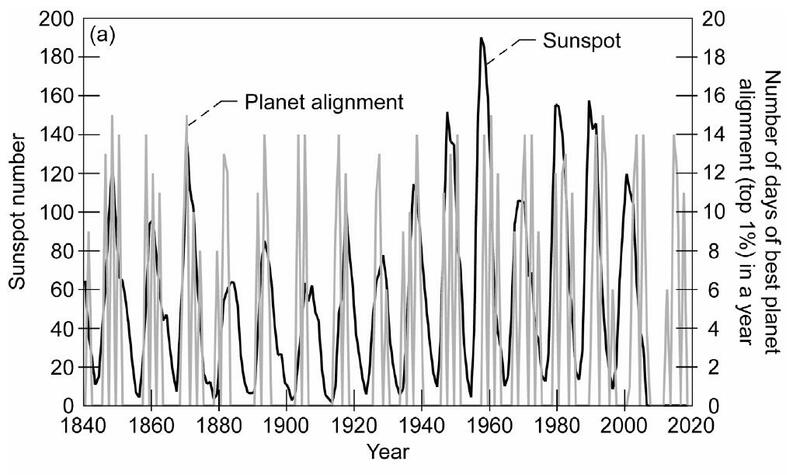 In 1780, 1990, 2000 the sunspots do their own thing and begin rising before the alignment. This just is not possible unless the solar internal cycle is much greater force than the alignmen. The peaks are not even significantly modified by the gravitational forces. What about the current much delayed cycle (not plotted)? Gravitational drivers cannot delay. It looks to me like a strange coincindence only. nuclear zone, they are an effect not a cause of EMF coupling in the solar system. Sunspot activity timing could lead or lag depending on internal energy levels. As a warn ocean can produce hurricanes if the winds aloft are favorable, if not, then only depression storms. Gravitation and EMF tidal effects would cause changes of pressure/density in the energy production levels of the most active layers in the sun. The temperature of any particular layer would be quite stable as more or less energy would flow out due to thermo-dynamics. While the timing of sunspots may coincide with events in the solar system, they may be effects and not part of the cause. TFP, you are thinking in terms of simple ‘colliding billiard ball’ cause and effect. This is a bit more complex, and involves internal feedbacks and harmonic resonances in the Sun, as well as a complex cycle of alignments which takes a long time to repeat. The sunspot count and alignment cycles shuffle back and forth alternatively leading and lagging each other. But one never goes a complete cycle ahead of the other. This is classic coupled oscillator behaviour. When they get out of phase, the solar cycles amplitudes become damped a while later. This is classic coupled oscillator behaviour with system inertia involved. Imagine the Sun is a big flagpole, it takes a while for small, well timed energy inputs to get the flag pole whipping strongly, and for it to diminish it’s oscillation when the inputs aren’t coming at just the right time. It’s not a perfect analogy, because the flag pole has a constant resonant frequency, whereas the Sun’s internal resonant frequencies (plural) sometimes get out of kilter with each other, as well as the planetary alignments, hence the big minima every couple of hundred years. Maybe imagine a flagpole which someone is hoisting a heavy flag up and down as you try to get it rocking. At the moment for example, the mid latitude belt in the southern solar hemisphere has “slowed to a crawl” according to Dr Hathaway. These every couple of hundred year big slowdowns in solar activity coincide with the conjunction of Uranus and Neptune. When Saturn gets near those two while Jupiter is on the other side of the sun, all the forces nearly cancel, and the centre of the Sun passes very close to the centre of mass of the solar system, sometimes going ‘retrograde’ in it’s motion. It’s a bit like when you gyrate a bucket to get the water swirling round in it, and then gyrate it the other way to damp the circular flow. Imperfect analogies, but I hope it helps you see how the forces may be coupled. Then of course, apart from the gravitational/tidal forces, there are the electro-magnetic effects to consider. I’m startig to think the energy flow doesn’t need to be from the planets to the sun for the planetary positions to affect sunspots and flares. Ching Cheh Hung successfully predicted the occurrence of big solar flares when planets moved overhead of the place they errupted from. Maybe it’s a bit like a Van der Graaf generator, the spark jumps from the surface of the globe to the nearest place it can ‘ground’ itself. The bigger the available grounding place, the more likely a discharge is to occur. Hence the higher incidence of discharges when there are alignments between planets and the sun, creating more conducive ‘pathways’ for the energy to discharge along. While the timing of sunspots may coincide with events in the solar system, they may be effects and not part of the cause. PG. I agree sunpots are ephemeral phenomena, the surface manifestations of underlying causes. It’s their ‘will o the wisp’ capriciousness in appearing , and growing, or disappearing again which makes me think they are very close to boundary conditions, and therefore susceptible to relatively small outside influences like the planetary alignments. By the way PG, if you are using firefox, and the only good use for internet explorer is to download firefox, try view – zoom – zoom text only. I can understand how perhaps an almost insignificant force caused by alignment could cause some sort of synchronism (fro example tidal forces on moon cause a locked rotation) but from the plots it is obvious that this is insignificant as to the actual internal sun “oscillation”. Looking at the 2000 peak there is no evidence of the allignment signal on the SSN. Basically saturn has a greater pull on the sun than the earth and murcury is pulling with more than half the force of the earth (at closest approach). Why are these missing from the allignment data? Ah, another person with a blindspot for the word electromagnetic. Don’t worry TFP, you are in fine company. In any case, the three planets Jupiter, Earth and Venus have a synchronous cycle which is coupled to the Sun’s oscillations, which amplifies their effect. Saturns orbital period excludes it from the club, though it may well have other effects on the Sun’s internal oscillation we haven’t yet worked out. I think you need to study resonance and the way it amplifies signals. In fact, we all do, since it is a poorly understood and under-developed field in the sphere of solar system dynamics. Try reading some of Ian Wilson’s papers and call back. Tesla described EMF energy wave spikes caused by two or more of his power towers that could destroy an aircraft. as in a rouge wave at sea. Resonance oscilation reinforce as you describe. Hi Tallbloke. Not that I want to encourage astrology or anything :-), but if you’re going to get anywhere with this project, I think that this is a more productive way to think of it than the other way around. You can still colour me dubious, though, because I don’t see how the magnitudes of the effects, and particularly the small changes in them as a result of planetary positions, could be as important as you feel them to be. To me it’s much like the reason why the Moon has more of an effect on terrestrial tides than the Sun does. The gravitational field of the Sun is much stronger, but it isn’t much different on the side of the Earth facing it than on the side away from it, and thus the Earth is ‘bathed’ in an almost constant field from that cause, so there isn’t much differential. As you point out, that isn’t the case for the Moon, whose field difference is proportionally much greater on the side of the Earth facing it than on the opposite side. I was reading the above comments with interest. Rog thanks for posting the links to some of my graphs. Don’t take it too seriously, it is just a hobby. No refunds given to the unsatisfied customers. Vuk, thanks for the links, always plenty of interest in your work. Please join in more with your insights on Geomagnetism and possible connections with solar activty. Apocalypse recalculated – whatever happened to ‘Back Radiation’?